We've had a lot of issues with gaming headsets recently, mainly down to the fact that so many of them use a USB connector and boast instant surround sound. All well and good if you're running onboard sound, but if you've spent out a little on a decent sound card, like the wondrous X-Fi, then no matter how good the cans, you're going to go for a set with analogue connectors. Plantronics has cleverly sidestepped this issue by bundling a USB dongle with in-built surround sound in the pack that you can plug the analogue connectors into if you don't have an audiophile's sound card. The sound is rich and bassy with the dongle attached and the mic thankfully can be moved right out of the way and out of eye-line. While the square plastic of the headset might not look that great the design is excellent, sitting lightly and securely on your noggin without needing a vice-like grip. 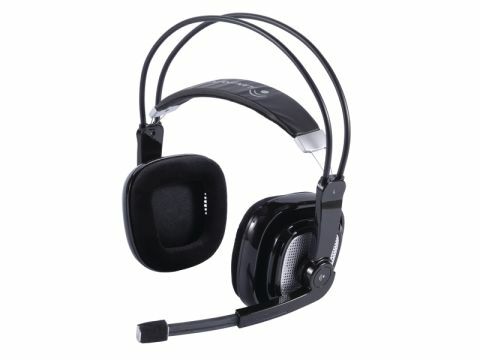 A quality gaming headset with a versatile edge.